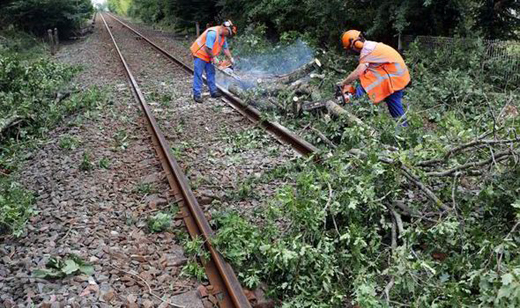 Mangaluru: June 21, 2015: The Mangaluru-bound Matsyaganda express which was scheduled to reach Mangaluru at 10.30 am on Sunday has been delayed as the tree fell on the railway track in the wee hours of Sunday. The train departed from Munbai at 3.20 pm on Saturday and halted for almost Six hours at Madgaon. The release from Konkan railway also stated following trains have been delayed due to heavy rain. 2) T-10104 UP MAO- CSTM MANDOVI EXP of June 20 is cancelled due to pairing train late. 3) Train No: 12134 Mangaluru Jn.-CSTM EXP of June 20 is cancelled due to pairing train cancelled. 4) Train No: 12619 Matsyagandha express departure Kurla (T) at 16:20 hrs. instead of 15:20 hrs.on June 20. 5) Train No: 10111 Konkan Kanya Express of June 20 will start from Panvel. 6) Train No: 11003 CSTM-MAO Mandovi Express will start from Ex. PNVL on June 21 is at 00:05 hrs. 7) Train No: 10112 UP Konkankanya Ex.MAO-CSTM of 20.06.15 is rescheduled at 01:00 hrs. on June 21.